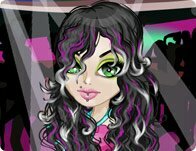 Description: This girl has diamonds on the inside, but she's got a way to show off her bling beyond just her glittering accessories and sparkling earrings. Look deep into her eyes and watch your eyes reflected back a thousand times in the many cuts of her jeweled pupils! Instructions: Use your mouse to click on and through the floating clothing, hair, makeup, and accessory options for this cool girl.